For more than 160 years, Holy Child Schools around the world have been committed to helping young women become strong, self-assured global citizens who use their gifts to serve others. A Catholic, Holy Child education nurtures a love of learning and a strong sense of self, as well as a lifelong commitment to service and a true respect for the inherent worth of every human being. Mayfield graduates are compassionate women of faith and action, ready to make a difference in the world. Together, the Theology curriculum and our Campus Ministry program enrich the inner life of each student and provide a strong moral compass in the face of a rapidly changing world. Students help plan and participate in monthly all-school liturgies and prayer services, where our community joins together in prayer to share our Catholic faith, and annual class retreats offer dedicated time for reflection, meditation and spiritual growth. Theology studies provide students with a solid understanding of Catholic teaching and a deepening appreciation for their faith in relationship with God and others. In light of Cornelia Connelly’s vision of educating the whole person, we support intellectual growth and faith development. In tandem with Christian service, retreats and worship, Mayfield strives to foster a deepening relationship with Jesus Christ. The Theology curriculum is in accordance with Catholic teaching and the Catechism of the Catholic Church. Be yourself but make that self just what Our Lord wants it to be. It’s really about making everyone realize that they are loved by God. That’s the whole goal of Campus Ministry. 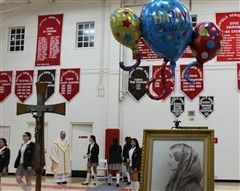 During a school-wide Mass to celebrate the birthday of our founder, Cornelia Connelly, students honored the courage of a woman ahead of her time, a woman who compassionately and joyfully dedicated her life to education. Our founder, Cornelia Connelly, deeply loved and celebrated the Epiphany in special ways with her Sisters. 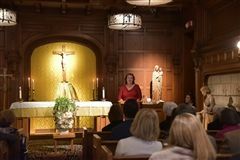 Head of School Kate Morin has written a beautiful reflection on this feast day and its importance to our Holy Child heritage. We want to share Kate’s loving words with you as we begin the new year. Under the guidance of our Campus Minister, Teri Gonzales, Mayfield students experience their faith with a joyful spirit, learning that teenagers can serve as disciples of Christ in profoundly meaningful ways. The work of Campus Ministry is at the heart of Mayfield’s Holy Child mission “to help others to believe that God lives and acts in them and in our world, and to rejoice in the divine presence.” Campus Ministry leaders are also involved in planning retreats, the annual Cornelia Connelly Day of Service and other Christian service efforts. Campus Ministry helps me express my love of my faith with the rest of my community. It has given me the chance to make my faith life what I want it to be, like planning our masses. Our Campus Ministry team is dedicated to making school Masses a deeply felt time of worship for their classmates. Try to help others, and each effort will be blessed on yourself. Each year, the entire school community celebrates Cornelia Connelly Day by volunteering at local service organizations. Students also help coordinate special school-wide service projects, including the Thanksgiving Food Drive, Christmas Toy Drive and the Lenten Clothing Drive, which benefit local food banks and shelters. The Senior Service Program is designed to nurture each student’s confidence, self-knowledge, and spirituality while she employs her gifts and passions to make a difference in the world at a significant milestone in her life, the time of transition to college and life beyond high school. Each year in May, senior students give 45 hours of service at an approved placement site in the local community. Mayfield Senior School students also become volunteer leaders in schools, hospitals and other community outreach projects, giving more than 15,000 hours of service each year to organizations. Each year, incoming ninth-grade students perform a morning of service as part of their freshman orientation. Students serve as Eucharistic Ministers, ushers, lectors and cantors.